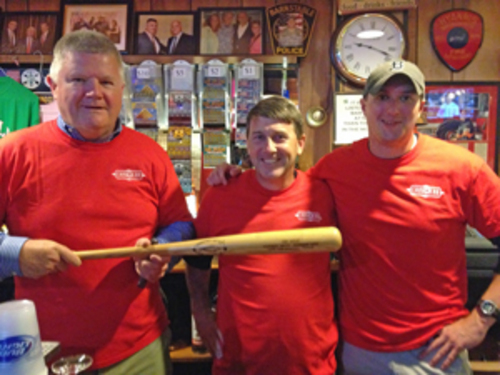 Chris Doherty, left, and Dave Cronan, co-owners of the 19th Hole, with employee Peter as they show their support of Red Shirt Friday and the Cape League. 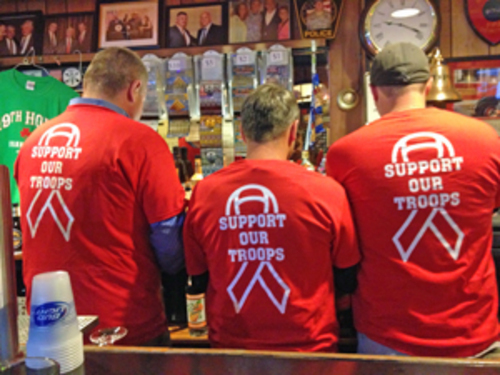 Red Shirt Friday has become very important to the Cape League as it promotes the fact that the League and our fans support our troops and veterans who have returned from very difficult situations. We encourage fans and everyone to wear a red shirt to support our troops on Fridays. Tonight at the Cotuit vs Falmouth game at 4:30 (new time) you will have the opportunity to meet members of the Home Base team who support veterans and their families through medical and emotional problems, at no cost to the veteran. The program is also coordinated and supported by Mass General Hospital, Partners and Red Sox Foundation. Tonight's booth will be manned by Jacque Franconia and Thor, the specially trained canine used for PTSD patients. This is the fifth year the Cape League has support Red Shirt Friday, an idea that came to us from Damon Collins of Advanced Embroidery. Very often a team will have a special military presence at the RSF game or singing the National Anthem. We hope you can join us in Falmouth this evening, or attend any Cape League game... but be sure to wear a red shirt!